Elenas is revolutionizing the direct sales market for 11 million women across Latin America. Our digital platform connects consumer brands with a community of social media savvy sellers who promote products to their networks. Recognized by TechCrunch as one of the top 15 tech companies in Latin America we are building the technology which will enable sellers to earn more for their families and give brands across the region access to an innovative digital sales channel. 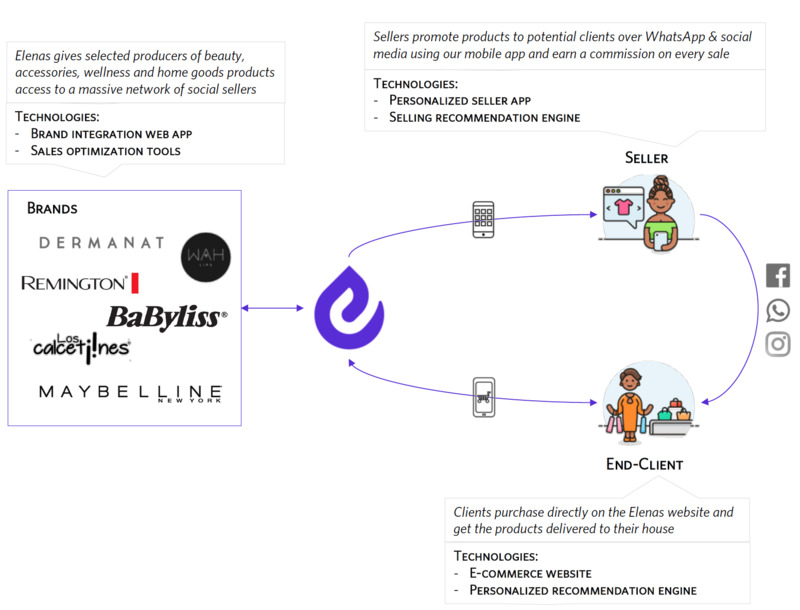 Our platform connects brands, sellers and end-clients via mobile applications which optimize the sales and distribution process for all parties. By combining the power of personal relationships with machine learning based recommendations we enable our sellers to earn more in less time. For developers, Elenas presents an opportunity to build industry-first technology from scratch and design a product which will combine marketplace technology, an innovative mobile-app, and big-data based purchasing recommendations, consumer personalization algorithms, and dynamic content. We’re looking for a driven computer engineer and technical strategist who can lead our development team and join our leadership at Elenas. This person will work to develop our technical product, map our data strategy, and build out and manage the development team. Experience as Full Stack Developer- Strong OOP skills and application architecture experience. Prior management of development teams as a Lead Developer/Scrum master/CTO/ VP of Engineering or similar. Entrepreneurial drive: We are looking for someone who loves to build from scratch and wants to be involved in the business at every level: discussing long-term strategy one day and developing the product the next. You should be comfortable with the ambiguity and risk associated with this type of business, but excited about the potential for huge-growth in the near future. Strategic mindset: We are constantly solving difficult problems and evaluating the business at a strategic level. You will be a key part of those discussions and we need someone with the analytical capability to contribute on a consistent basis. Leadership presence: You should be someone who inspires others with their passion for the business and the product we’re building. We want a leader who can attract other developers to the team and help them to grow and learn within our organization. Customer focus: At Descubre human-centered design and a customer-first perspective is at the core of who are. For you building a technical product shouldn’t just be about writing code, but instead should be about building a solution and product which our clients love. You’ll work alongside the leadership team to design the product roadmap and make key strategic decisions across all aspects of the business. Salary is at competitive local market rates, with options for equity compensation and significant growth based on performance. Opportunity to live and work in an exciting and diverse location centrally located within Colombia and Latin America. Help with visa and relocation if needed. Hi, You might be interested in this job at Polymath Ventures. Check it out here: https://polymathv.com/join-us/1211058/CTO+%28Chief+Technology+Officer%29/. Bye!